Steve Atlas (Brammo) won the TTXGP 2012 North American Championship this weekend, while team-mate Eric Bostrom won the weekends race. Matt Kent (Virginia Tech) won in the TTX75 award group (7.5 kilowatt-hour battery pack), and Kenyon Kluge won in the eSuperStock award group. Eric Bostrom lead after the first half of the first lap, and ended up nearly 17 seconds ahead of Steve Atlas. 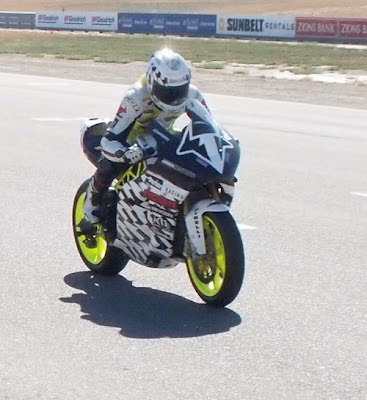 Considering that at Laguna Seca, Atlas finished just a couple seconds behind Michael Barnes riding for Lightning Motorcycles, one wonders what would have happened had Lightning ran in todays race. In every meeting to date between Lightning and Brammo, Lightning won convincingly. Since the Laguna Seca race, Brammo has been working hard tuning the new motor provided by Parker, and working with Bostrom on the setup of the bike. Would Lightning beat Brammo today, or would it be the other way around? We can't know. 1st place winners get 25 points, 2nd place winners get 20 points, 3rd place winners get 16 points, and so on. How could the season results have been different had Lightning shown up to race? This question is a great "what if" that we are not privileged to know the answer, because the universe we live in took a different path. Where was Lightning? Preparing for the e-Power/TTX race at Le Mans next weekend. Jeremiah Johnson (BE-EV.COM) was present and ran in the qualifying and practice races. While he has improved his bike considerably since Laguna Seca (where it didn't even run), the bike gave Johnson enough trouble on the track that he pulled out of the race.